So, this weekend has been major for our family. We had T's onstage debut in Telethon for Santa and we found out the gender of baby #2!! Because I like to do things in chronological order, we start with Telethon for Santa. If you really can't wait to find out, you can always scroll down and then come back!! So this week was T's theater debut and I must say I am thoroughly impressed. He spent practically every day last week at the theater helping is dad and Uncle Chris put together the set for the show, often missing naps. Then he would spend all evening at rehearsal. He never caused a problem or had a fit and he was a delight to his fellow actors. Opening night of the show was Friday and I was every so slightly nervous of how he would react to an audience. It was like he didn't even know they were there, except when he got a laugh, which he utterly enjoyed. He actually got 2 big laughs in his first show! The first was when he sneezed in the middle of my line. The second is when he kicked his feet when one of the other elves has to hold him awkwardly to make it seem like he's never held a baby. In all he had to be carried by 2 other people during the show and he never made a fuss or reached out to mommy. This 2 year old definitely has what it takes to be in theater! Back stage he was quiet when he had to be and he actually enjoyed watching the show from side stage when he had the chance. He even had a cold which didn't affect his good behavior one bit! Besides the show this whole weekend has been crazy! Friday night I had work, then taught a hip hop class, and then had the show. Saturday, T had dance class then the matinee show, then an ugly Christmas sweater party. Sunday was the gender reveal shoot, another matinee performance, and finally dinner at Aunt Katie's for her birthday and a visit with Santa. Some things had to give, but it was a long weekend none the less. Back stage with mom and dad. Soooo now it's time for the GENDER REVEAL!!! Sunday morning we went to the park and my sister in law, Katie, had filled a big box with balloons. 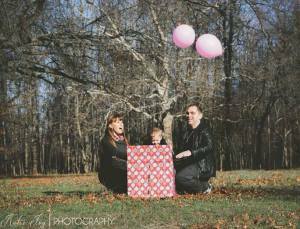 The idea was to have T open the box and we would learn the gender based on the color of the balloons. 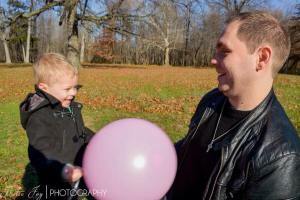 We then did a variety of shots with the balloons. It was so much fun and I love the shots that Katie got. It definitely captured our emotions and excitement. It's a GIRL!!! You can check out Katie's work at http://www.katiejoyphotographyny.com. She is great to work with and very patient with kids. Far more patient than you might be, lol!! I hope you enjoyed our weekend recap! Stay tuned Thursday for our Christmas craft project!